Several days a week, James Valastro runs a machine at Keurig Dr Pepper. For 25 years, he's also freelanced as a videographer, director, editor and location scout. While scouting all over Vermont for companies such as L.L.Bean or Mercedes-Benz, the South Burlington resident has taken thousands of photos, and, he says, "I get to meet a lot of people." About four years ago, some of his photos began to sprout chickens — cartoon hens, that is, doing people things. No roosters, Valastro clarifies; they're "mean bullies," and he has no use for mean. According to the origin story Valastro tells, he was filming at an organic egg farm and found the chickens "quite funny." He asked when the hens usually laid their eggs. The answer was about five in the morning. When were they let out of their pen to graze freely? Around seven, the farmer said. Valastro wondered: What do they do with the rest of their day? Imagining answers to that question became a comedic obsession. "Farmers would tell me stories," he recounts, about chickens that followed them around or flapped up to their shoulders and rode. One mischievous chicken even stole a farmer's tools. Valastro, who had taken a cartooning class "during a low point, after my brother died," he says, was inspired to draw his first chicken cartoon. In it, a farmer is fixing pipes on a watering system. A chicken grabs his wrench and runs away to install a solar array on the roof of the barn before the farmer even notices the tool is missing. With no formal training in art, the nascent cartoonist found it "a lot of work" to draw the backgrounds, he says. 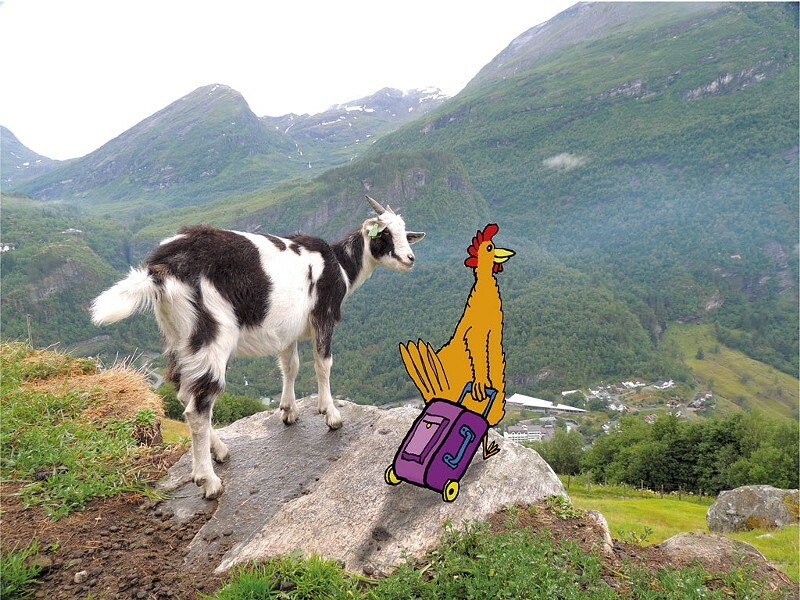 So Valastro hit on the idea of inserting chickens into his photographs: hens pulling luggage on rollers after a vacation; hens on vacation at a scenic overlook; hens skateboarding or using heavy equipment or computers; hens as dock workers or long-combed musicians. "Any time you can have a chicken in a hard hat," he observes, "you're halfway there." Valastro already had a multitude of photographs to work with, but he began composing new ones for their fowl possibilities. The results are inherently, cheerfully silly. Sometimes the images read as subtly feminist; hens are female, after all, and in Valastro's world they take charge. Brunelle cuts out and scans Valastro's cartoon hens and inserts them in the designated photographs per Valastro's vision. A founding member of Vermont Comic Creators, he says the two became acquainted at an organization meeting a few years ago. "He has a good eye — I give him a lot of pointers about drawing, which is new to him," Brunelle says of Valastro. "I told him about the philosophy of cartooning: Anything goes, but you have to be consistent." As for Valastro's pictures, the artist adds, "They're a lot of fun — James has found a niche that people seem to enjoy. They're gentle, droll humor. They're not threatening, and they don't hurt anyone." 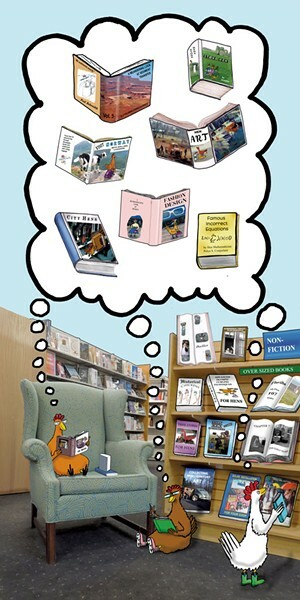 One hen-art fan is South Burlington Public Library director Jennifer Murray. She recently commissioned Valastro to create a banner for the library, which is currently located in the University Mall while a new facility is under construction. Murray recalls attending an event put on by South Burlington businesses that highlighted local artists. "James was there with his hen art, and it made me laugh," she says. "We're spending so much time talking about what we're going to have in the new library, I thought it would be fun to commission a piece of art that we could enjoy right now." Murray says the banner's humor "appeals to all ages, and the library has all kinds of patrons. It meets everyone's needs," she adds, "because laughter is indeed the best medicine." These days, Valastro can't see the world without chickens in it. 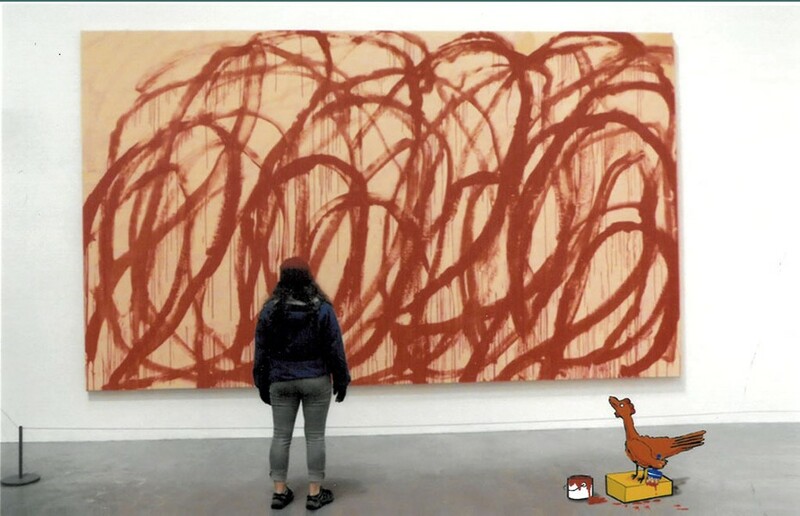 During a trip to England with his family, for example, he photographed his daughter Laura standing in front of a contemporary abstract artwork in the Tate Modern. Later, he inserted a chicken, a can of red paint and a brush alongside her. The intention is obvious. Valastro, 63, calls his hen hobby a "late-in-life thing for me," and he's clearly having fun. If he bends the physical abilities of chickens for comic effect (opposable feathers! ), he's learned facts about them, too, which he sprinkles into conversation. "Did you know light goes through their comb and feathers?" he asks a reporter, displaying a moody photo taken in Québec City in which a lone hen walks down the street, casting a long shadow. Born in Denver to parents from the Adirondacks and Queens, N.Y., Valastro comes from a family of artists. His brother was an oil painter, his mother an interior designer. His father was an architect and fine-art photographer who "always had a camera around his neck." Valastro has appropriated some of his dad's images, such as one in which two people try to fit a huge painting into the back seat of a car. In his update, chickens wrangle canvases of their own. Brunelle is encouraging Valastro to develop a couple of the hen characters, to give them more of a story line. He's thinking about that. Animation, too, is under consideration. "It's my journey to go for laughter," Valastro says. "The world needs spaces for laughter. I'm going to curate my world, bringing capable, talented hens having a wonderful day." The original print version of this article was headlined "Cluck of the Draw | Photographer-cartoonist James Valastro has a yen for hens"